A Lamborghini is hardly on anyone’s list when looking for a car to go off-roading. Well, almost all Lamborghinis have all-wheel drive but it’s still not the best option to take for a day away from paved roads. It’s nerve-wracking for a die-hard Lamborghini fan to see one of these Italian vehicles caught up in a situation where exposure to dust and other earthy materials is at an all-time high and the magnificence of this Italian creation is laid to waste. There are several Lamborghinis like the LM002 and the upcoming Urus that could make it off-road but there are those like the Huracan that just aren’t the type you’d like to see get down and dirty. However, Scottish-Australian pet-food magnate and rally enthusiast Tony Quinn thinks otherwise. 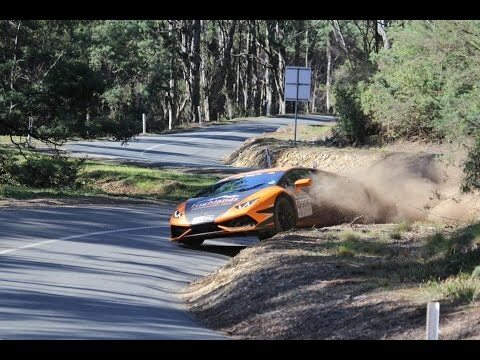 Quinn was seen during the second day of this year’s Targa Tasmania rally putting his Huracan through very difficult maneuverings off-road. The tarmac-based rally event Targa Tasmania has been held every year in the island state of Tasmania, Australia since 1992. It is has always been a five-day event except during its 10th, 15th, 20th and 25th anniversary when it is held for six days in a row. This year, at the second day of the said event, Quinn managed to wow the audience by pulling a stunt with his Lamborghini Huracan. Along with his co-pilot Naomi Tillet, Quinn made his ten-cylinder Huracan jump to a dirt embankment during one turn in the course, impressing people not only with his skilful handling but also by how the Huracan managed to still be intact despite getting off-road. Seeing more than thirty people watching them on the spot, Quinn deliberately executed the stunt which gained wows from the crowd. Quinn knew that a camera was directed at them and he was kind enough to give the crowd a bit of excitement. Quinn has been a constant participant in the two-decade old road rally event and has even won twice – back in 2009 and in 2011. He was behind the wheel of a Nissan GT-R back then. This year, Quinn and Tillett will be competing in the GT4 category where they currently hold the fourth place in the class standings. We hope nothing but the best for this duo and look forward to more stunts that’ll leave the crowd slack-jawed. And hey, let’s not forget the Lamborghini Huracan that braved through an uncharted course and managed to get through the challenging roads in a highly respectable fashion. Let’s hope to see more of these Lambos test just how far their limits go.